Try this yourself. 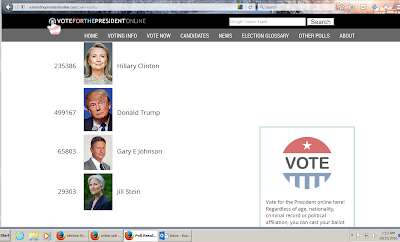 Type in "Live Presidential Poll Online" and try real hard to find any live online polls that you can vote in. One used to pop up near the top, only one. Everyone else is focusing on straw men, like "who won the debate". The live poll shown in the image below used to pop high on Google, now it is much harder to find. We know that Google is in cahoots with Big Gov, and the Uber rich globalists. This no longer needs to be debated. 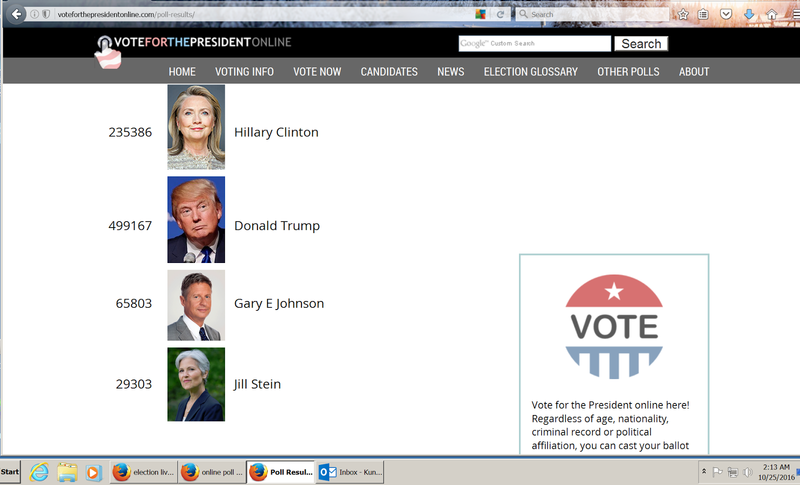 I think the polls miss a little. Who will white men vote for? Who will their wives vote for? That is the biggest single block of voters. 50 million white married couples. Yet she goes on like a broken record. Her biggest block is the 'something for nothing' bunch, growing larger due to themselves and their political choices. We will see just how well the witch and the witch-brew media has conjured up the pot. Whether the country has a pot to piss in or a window to throw it out?